Daytime views of Big Sur are tough to beat, but for the past month, a trip along California Highway 1 after sundown has offered passersby a rare sight of the jagged coastline aglow, thanks to a dazzling phenomenon known as bioluminescence. Similar to the glow of a firefly, the bright blue flashes lighting up the ocean waves are the biochemical reaction of small, algae-like organisms known as dinoflagellates. The little critters light up as a self-protective reaction to perceived danger, such as a kayaker’s paddle or the movement of crashing waves. The result is otherworldly. According to Steven Haddock, Senior Scientist and Marine Biologist at the nearby Monterey Bay Research Institute, bioluminescence isn’t all too uncommon, but the intensity depends largely on a handful of environmental factors. Reports of bioluminescence in Big Sur have lessened over the past few days, which Haddock guesses is likely due to the week’s stronger winds and waves. Until the next bloom, there are a handful of other spots in the West where you can witness the wonder. Reports of impressive blooms over the past few years in both Torrey Pines (pictured) and Mission Bay have drawn visitors and locals alike to catch a glimpse for themselves. 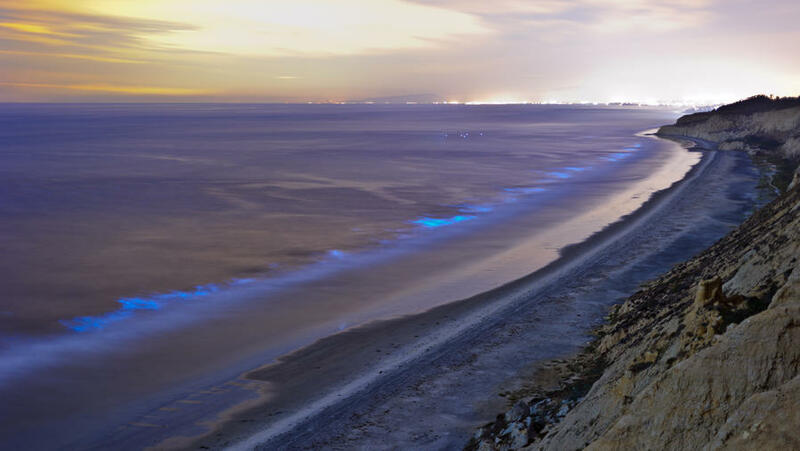 The algae, which appears red during the day, glows bright blue in the moonlight, creating a captivating scene for evening surfers. Just north of San Francisco, Tomales Bay (also famous for its oysters) boasts a colony of neon-colored phytoplankton and the opportunity to see them via nighttime kayak tours. Thanks to its sheltered locale, Haddock says the bay may be a more reliable spot to catch the phenomenon than other open-ocean destinations, which have less predictable wind and wave activity. Just north of Oaxaca’s popular surf town, Puerto Escondido, this lagoon boasts annual bioluminescent activity and guided night tours of the lagoon. Visitors have the chance to kayak, and are also encouraged to swim and splash around in the water in order to trigger the light reactions.